Master en suite bathroom - toilet, bath with shower. Enclosure, main bathroom - toilet, bath with shower. Both bathrooms are identical and have a bath and separate shower. Golf courses (5) within a few minutes drive. Aldea Blanca is in the golf valley leading up from Puerto Banus and is also convenient for the wives/ladies who don't play golf to go shopping in Puerto Banus - walkable or a €1 bus or €5 taxi ride. The following courses are a short drive away - Aloha, Los Naranjos, La Quinta, Las Brisas, or a longer drive for a special treat at Valderrama. Further information and a map of the courses is in the apartment. Local activities include diving, swimming, tennis, walking, sailing, cycling, fishing, horse riding, golf, windsurfing, water skiing, mountain biking, paragliding. Nearest airport: Malaga at 28 miles. Airport transfers - Taxi, 40 minutes, can be arranged €75 approx each way payable to the driver or Airport bus 40 minutes €6-€8 to/from Marbella. Car is not necessary. Local area bus service for Puerto Banus and San Pedro. Also from N340 or Marbella Bus Station to other towns. There are many restaurants and a Tapas bar within walking distance so lots of drinking and no driving. There are also 3 supermarkets and a Pharmacy within walking distance including Puerto Banus and the beach. They are all marked on the map in the apartment. Aldea Blanca - is centrally located in a sought after area for all tastes, from glitzy and glam to peace and seclusion and of course the golf. It is in a beautiful and tranquil setting in a residential area very close to all amenities. Many of the owners live there permanently. 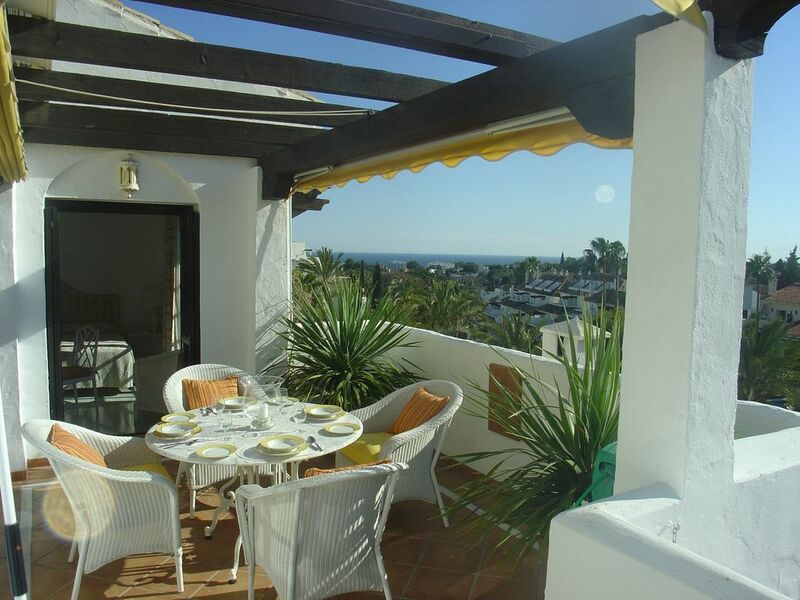 It is within walking distance of Puerto Banus and the beach. The restaurants and amenities are open all year and it is worth a visit during the off peak Nov-Mar months for the climate when the day temperature can reach 20+ degrees The evening temperatures in the off peak months can be cool but the apartment is well equipped for the cooler evenings - central heating, wood burner fire, heated towel rails, bathroom underfloor heating, books, satellite TV, video, DVD,CD - just like home so very cosy and comfortable if necessary but still possible to enjoy the outdoors during the longer than UK winter daylight hours. Puerto Banus and Marbella - for El Corte ingles, the Harrods of the Costa, designer shops, jet set marina, nightlife until dawn and much more. San Pedro - for the new long promenade, beach and play park for small children and beach restaurants for the best of local fresh fish. Also, a more Spanish feel when having coffee in the pavement cafes up in the town and visiting the weekly 'local' market on Thursday. Accessible by bus from Centro Plaza close to the apartment which goes via La Campana or a 10 min drive. Benahavis - the gourmet village of the Costa del Sol, up in the mountains, so beautiful scenery as well. Los Abanicos is a favourite restaurant. Gibraltar - an easy drive and worth a visit if only for the duty free. The apartment was built to a high spec. It spans the entire top floor of an Andalusian style casa so it has windows on all four sides including six sets of French doors, four of them opening out onto the large L-shaped terrace (34sq.m).